Up your game! Improve your casting, fishing techniques and fly tying. The FWFF club has an active education program available to everyone, with something for new, novice fly fishers to experienced anglers. 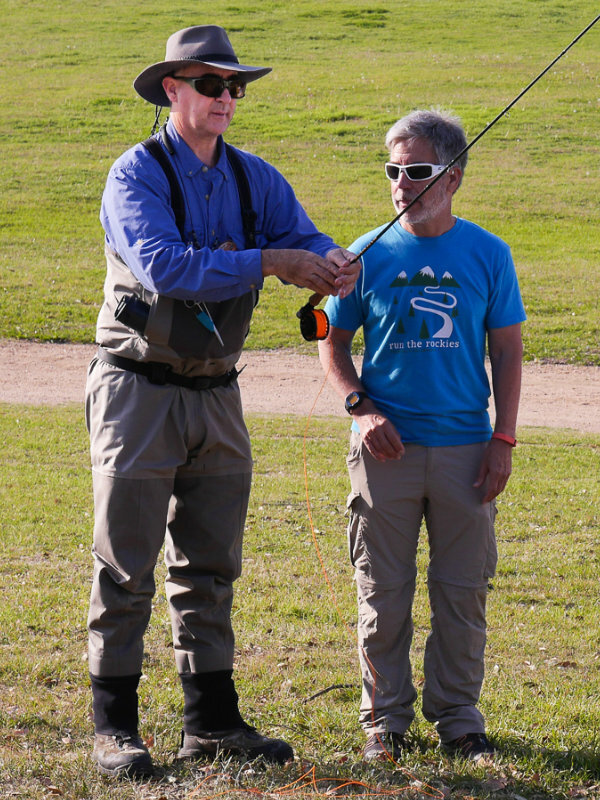 Each month we have a Quick Clinic featuring a specific topic that provides insight and practical learning on a fly fishing-related topic, and quarterly we organize a local fishing outing, which we call Fly Fish 101, dedicated to helping first timers and those with little experience fly fishing. We teach them to how to cast, make contact with a fish, and land it! Starting at 6:40 p.m. before each monthly meeting, we hold a Quick Clinic. A member of our club presents a brief review of tips for tackle, tying knots or catching a specific species of fish. Just arrive by 6:40 p.m. and look for the Quick Clinic table and gathering of folks. Take Advantage of Fly Fishing Educational Opportunities provided by the FWFF club. For those of you who are new to the club, we have an active education program that will help you through the learning curve from how to set up your rod, select flies, cast and present your fly to the fish. Once a quarter we organize a local fishing outing, which we call Fly Fish 101, dedicated to helping first timers and those with little experience fly fishing, and teach them to how to cast, make contact with a fish and land it. If you’re a novice and want to take the full “tour,” we have casting help as well as instruction on tying on tippet and how to make fly choices for the types of fish being targeted that day. If you just want some tips, we will have mentors on location to help with that, too. For those of you who are new to the club, you’ll be asking lots of questions about “how”, “when” and “where” to fly fish locally or get ready for that trip of a lifetime. We do our best to answer those questions, too.